Their mission is to build the best Closed Circuit Mixed Gas Rebreather in the world. The Harmmerhead CCR is built tough, smart and safe. The Hammerhead Rev. C. controller is now the industry standard, available for virtually every manufacturer eCCR on the market and many that are no longer made. 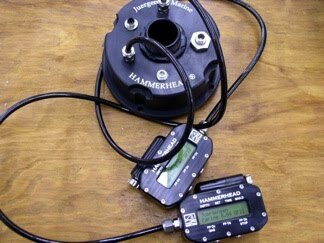 The Hammerhead electronics have been adapted for use on the following units, as well as many other rigs currently in development. It is also the de facto standard for Homebuilders worldwide. Juergensen Marine is the ONLY company which supports homebuilders with ready-made control solutions for their own experimentation. Combining extremely low breathing resistance via twin OTS Counterlungs, a high MTBF giving outstanding reliability and ruggedness, easy end-user serviceability, and a depth rating of 100 Meters, the Hammerhead eCCR is proving to be the first choice of Expedition Grade divers. The Hammerhead CCR is in use by hundreds of divers all over the world, from deep water exploration in the Red Sea (over 560 fsw - 172m ), to cave diving in Mexico, all without a single operational injury or failure. The name Juergensen is now synonymous with the ultimate in diver safety all over the globe.